For the past several months, California and Texas — two of the most productive agricultural states in the US — have experienced severe drought leading to difficult conditions for farmers in both regions. A new report from The University of Texas at Austin now believes that things have gotten so bad, that the nation’s food supply may be at threat. Between the two of them, California and Texas, produce most of the country’s food, but they also account for half of all groundwater depletion in the U.S. because of irrigation. The worst-affected areas include the Texas Panhandle, western Kansas, and the Tulare Basin in California’s Central Valley (which is also known as the nation’s “fruit and vegetable basket”). The study also revealed three disturbing results. First, during the most recent drought in California’s Central Valley (2006-2009), farmers in the south depleted enough groundwater to fill the nation’s largest man-made reservoir, Lake Mead near Las Vegas—a level of groundwater depletion that is unsustainable at current recharge rates. Second, one-third of the groundwater depletion that occurs in the High Plains is for just 4 percent of the land area. And third, if such practices continue, many areas of the southern High Plains will be unable to support irrigated agriculture within a few decades. The High Plains are sometimes referred to as “the bread basket of America,” and along with the Central Valley it’is responsible for $56 billion worth of agricultural products (2007 figures). Since the region became the farming heartland of America in the early 20th century, irrigation practices have caused groundwater levels to drop by as much as 400 feet in some places. While a series of dams, reservoirs and canals have helped to rise these levels back up by 300 feet, large-scale pumping coupled with droughts have caused levels continue to fall. 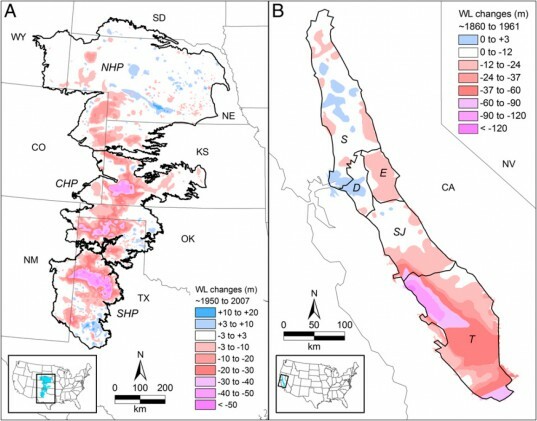 Using data from NASA’s GRACE satellites and computer models to study groundwater depletion in the two regions, Scanlon and her colleagues have been looking at several ways to make irrigated agriculture in California’s Central Valley more sustainable. One idea has been to replace flood irrigation systems (that is currently used on about half of crops) with more efficient sprinkle and drip systems and to expand the practice of groundwater banking. These underground storage reservoirs help to even out water supplies during extreme climate events such as droughts. However Scanlon doesn’t believe these measures can solve the problem in the High Plains, as groundwater levels are simply too low in some places. “Basically irrigated agriculture in much of the southern High Plains is unsustainable,” said Scanlon in a press statement. And how will the region’s farmers cope? It seems they will have to switch from irrigated crops such as corn to non-irrigated crops such as sorghum or convert their fields to rangeland. 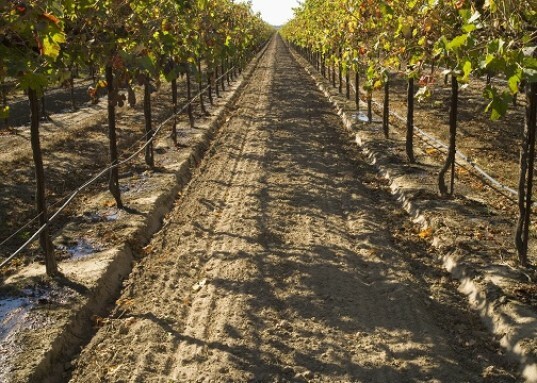 For the past several months, California and Texas -- two of the most productive agricultural states in the US -- have experienced severe drought leading to difficult conditions for farmers in both regions. A new report from The University of Texas at Austin now believes that things have gotten so bad, that the nation's food supply may be at threat.